(NewsUSA) - Sponsored News - Family time can be scarce these days, with activities and distractions pulling parents and kids in every direction. But a family-friendly television network, INSP, wants to change that. In an increasingly polluted television environment, they are one network trying to offer a breath of clean air. Building its alternative one show at a time, INSP recently kicked off "Destination Fridays," a trio of programs that are appropriate for audiences of all ages. "State Plate," starring Taylor Hicks (of American Idol fame), is the newest original series to join INSP's Friday lineup. Each episode features the cuisine of a particular state. During the show, Hicks visits farms, ranches, markets, festivals, and other diverse and unusual locales as he assembles a plate of the most popular foods in each state. For example, viewers can expect to learn about crab cakes in Maryland, peach treats in Georgia, potatoes in Idaho, and chili in Texas, along with the interesting history and often humorous stories behind each state's food traditions. Joining "State Plate" on Fridays is "Handcrafted America." Host Jill Wagner journeys across the country, introducing viewers to unique, gifted, and entertaining artisans who preserve and build on traditional skills as they make arts and crafts the old-fashioned way - by hand. "Destination Fridays" kicks off each week with "Cash Cowboys." The show features Scott Cozens, a journeyman electrician- turned-lawyer, and Sheldon Smithens, a third-generation antiques dealer and auctioneer. Together, the pair rummage through barns, basements, attics, sheds, flea markets, and more in search of hidden treasure, sporting their signature cowboy hats and Western gear. The hook: They will buy anything -- from motorbikes to folk art memorabilia -- in hopes of turning a profit. But these cowboys aren't just about the money; they have a passion for the past, the thrill of the chase, and the surprise of the unexpected gem. From the producers of "American Pickers," the series has tested well with INSP's core family audiences, and promises to entertain fans of antique and "picker" shows as well. 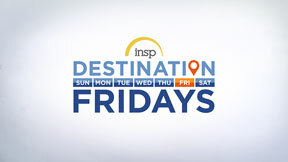 "Destination Fridays" begins at 8:00PM ET each week with "Cash Cowboys"; "State Plate" follows at 9:00PM ET, and "Handcrafted America" at 9:30PM ET. For more information, visit insp.com.